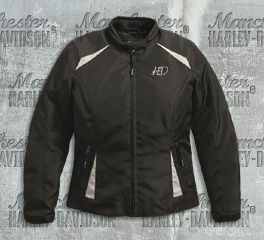 Women's Harley-Davidson® CE Certified riding jackets. 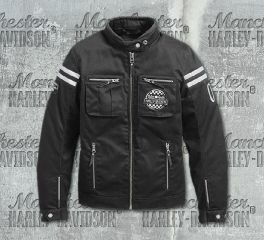 Harley-Davidson® Miss Enthusiast CE-Certified Leather Jacket is made from midweight abrasion-resistant cowhide leather. Polyester mesh lining. It features a leather patches and embroidered graphics design. It has zipper hand-warmer pockets, and one zipper vertical interior pocket. EN 1621-1 CE-approved removable body armor at elbows and shoulders. Back body armor pocket fits CE Level 1 Back Armor (98150-17VR, sold separately). Meets or exceeds CE requirements in abrasion resistance, impact testing, and seam bursting for personal protective clothing. 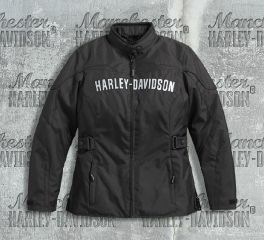 Harley-Davidson® Women's 115th Anniversary Eagle CE-Certified Leather Jacket is made from heavyweight, abrasion-resistant buffalo leather jacket. Get even more protection with EN 1621-1 CE-approved removable body armor at elbows and shoulders. Add even more protection with the back-body armor pocket by fitting CE Level 1 back armor (98150-17VR, sold separately). Meets or exceeds CE requirements in abrasion resistance, impact testing, and seam bursting for personal protective clothing. Bringing the edge of contemporary to your style. Abrasion-resistant buffalo leather for protection with EN 1621-1 CE-approved removable body armor at elbows and shoulders. Add additional protection with body armor pocket in the back, which fits CE Level 1 Back Armor (98150-17VR, sold separately). 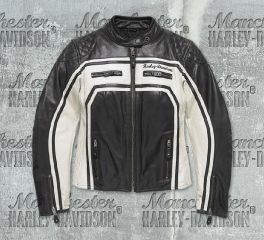 And the removable liner makes this jacket perfect for year-round riding. Add this iconic look to your ride with pure style and clean cut. 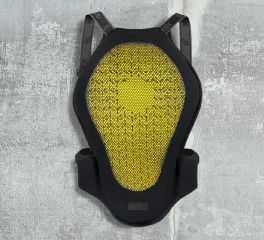 You also get protection with EN 1621-1 CE-approved removable body armor at elbows and shoulders. But this jacket is also about versatility. The removable liner makes it perfect for year-round riding. Simplicity has no room to your Harley® wardrobe. 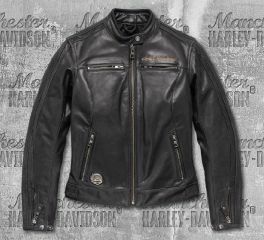 Get this jacket with features you need for riding. Features like abrasion-resistant buffalo leather for durability. More protection with EN 1621-1 CE-approved removable body armor at elbows and shoulders. And ride all year-round with the removable liner. It’s great off the bike too, especially when it’s cold, with two hand-warmer pockets. Fashion and function, dressed in style. Made from buffalo leather for durability, with contrasting cowhide leather stripes and sides. Power-stretch sides give you freedom of movement. Tough, stylish and versatile jacket. This will do all the talking! Abrasion-resistant 100% polyester hard mesh. H-D® Women's Shoulder Protector EN 1621-1 CE-approved body armor, certified CE Level 1.